Ready to see something amazing….? I’ve mentioned before that we live in a fixer-upper, right? Well, most of the ‘fixing’ that need to be done has been to erase the horrible things that the previous owners did to the place. No one was brave enough to take on this challenge. But WE decided that a few ‘surface’ problems wouldn’t scare us away from a good deal on a structurally sound place. The previous owners painted EVERY room in this place some terrible (and I really do mean terrible) combination of colors. They had even painted most of the ceilings, but the realtor made them paint those white before showing the house. He made them cover up some other things, too, we discovered later. 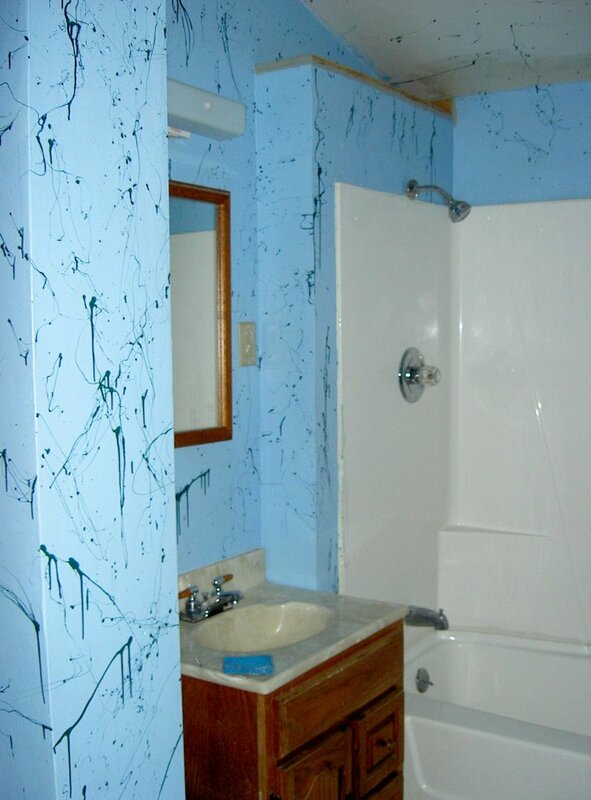 But there was no covering up the upstairs bathroom – easily the ugliest room in the entire place, which was no mean feat in this technicolor house. (I’ll post more before and after shots, later, to show what I mean). I’m happy to report that that’s all behind us now! We had hired a painter before to try to cover this stuff up. He said that he went through ten sheets of sandpaper on his electric sander, just thinning down the three dimensional green splatters. We painted the walls a light grey then. It was better, but we still weren’t happy. There are a couple of decorative strokes of genius in this remodeling job. Note the decorative cornice Todd installed on the upper left of the shower. And on the right side of the shower, he installed a white strip of trim to cover a previously awkward drywall ledge. Todd is truly gifted in the remodeling, grouping, renovating, and decorating arena. He has a special eye and a deft touch. You can hire him to help decorate your walls though his business, Wallflower, accessible online at wallflowerweb.com. Thanks, Todd!! You are currently browsing the archives for the Fixer-Upper category.